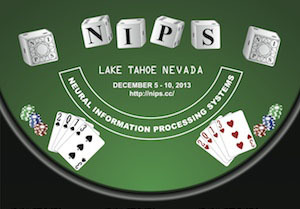 Video lectures has posted the videos from the 2013 NIPS Workshops held in Lake Tahoe. Richard Wilkinson, The University of Nottingham. Judea Pearl and Elias Bareinboim, UCLA. Rob Fergus, NYU. Jeff Bilmes, University of Washington. John Langford, Microsoft. James DiCarlo, Massachusetts Institute of Technology.